THE ONE AND ONLY BREAD YOU SHOULD USE FOR GRILLED CHEESE SANDWICHES. Can we be frank? 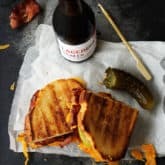 If you’re making grilled cheese sandwiches on anything other than sourdough bread there’s a good chance you’re mental. I don’t really care if you’re mental and I firmly believe that we can still be friends because who isn’t mental? But I will question almost everything you do from here on in based on this whole sourdough thing. I’m concerned you’re also the kind of person who puts ketchup on your grilled cheese. If you DON’T use sourdough bread for your grilled cheese sandwiches it’s entirely possible that up until now you just didn’t know any better. Now you do. There are 2 main reasons to use sourdough bread for grilled cheese sandwiches. Sourdough toasts up beautifully on the outside while retaining a good chew on the inside. Flavour, flavour, flavour. Or flavor, flavor, flavor for my American friends. 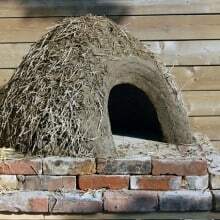 Since building my outdoor cob pizza oven and discovering the world’s best bread book The New Artisan Bread in 5 Minutes a Day I’ve been making a lot of bread. A lot. Some would say too much. Mostly people who are walking behind me. Up until 2 years ago I made sourdough bread from my own starter that I showed you how to make on this website years ago. But I let my sourdough starter die a sad death and it’s time for me to make a fresh batch. So what is Sourdough exactly? Do you remember years ago when there was a bit of a fad with people passing around a gross glop of dirty looking glue? You were supposed to take a bit out, separate the rest and pass it along to a bunch of unsuspecting friends. It was like a chain letter but with something you were worried people had sneezed into. Sourdough starter is what you need to make sourdough bread. Sourdough starter is basically a mixture of flour and water that’s been left to ferment and turn into liquid yeast. Sourdough yeast tastes different than regular yeast because it’s fermented and has a slight sour taste to it which gives sourdough its distinct flavour. O.K. 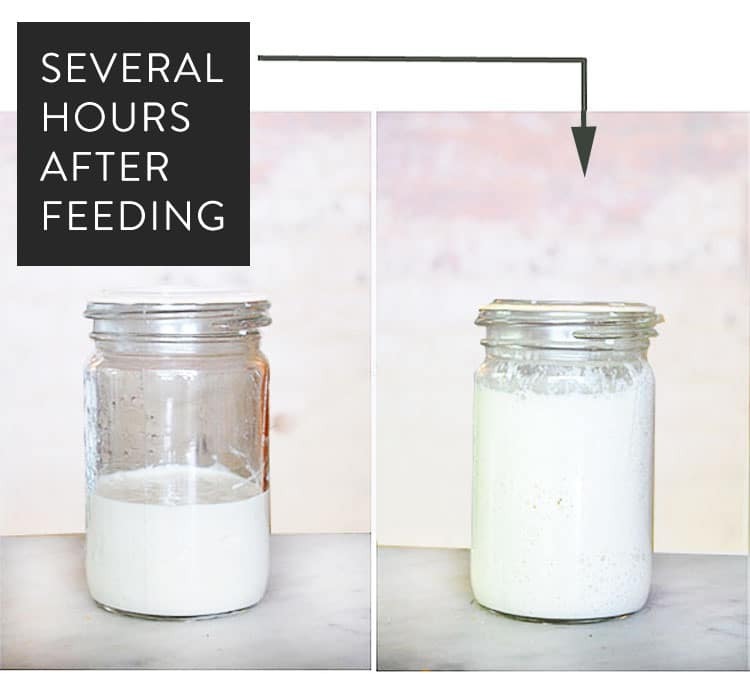 NOW do you want to know how to make this miracle of nature known as sourdough starter that has you catching wild yeast from the air. I thought you might. I learned how to make natural sourdough starter from the book Wild Fermentation by Sandor Ellix Katz. This book has every possible way to ferment anything. It’s a hipster homesteader’s dream. One of the first things you learn in the book is how to catch wild yeast to make sourdough starter. Otherwise known as glop. I made that up. I’m the only person who calls it glop, but it’s pretty appropriate if you ask me. “Catching wild yeast” is a bit of a romanticism. You are, in fact, catching wild yeast, but yeast is pretty much in abundance everywhere. You know when grapes have that white haze on them? YEAST! Yup. The white haze on grapes is yeast. Yeast is on your hands, in your home, and on the wind. Which is lucky for we sourdough starter makers. 1. Mix 1/4 cup clean (filtered or bottled) water with 1/4 flour. Rye flour, whole wheat flour, white flour…whatever you want. I used rye because it apparently ferments quicker than other flours. Stir it together. Cover it with a cloth. Let it sit for a couple of days. After just 8 hours I could already see tiny bubbles starting to form. You’re waiting for bubbles and a slight yeasty smell, like beer. Or … like yeast, I suppose. Once you notice bubbles and a yeasty smell (after 2 or 3 days) you can get rid of half of your mixture. Just scoop it out and throw it down the drain. It may have dried out a bit. That’s O.K. Add 1/4 cup of water and 1/4 cup of flour again to the remaining starter, mix and cover up again. Do this every 8-12 hours for the next 2 weeks or so. Remove half the starter, then add 1/4 cup water and 1/4 cup of flour. Wait 8 – 12 hours and do it again. After several days of doing this you’ll notice the bubbles are starting to get bigger. By day 12-15 you’ll notice your starter will start to double in size after you feed it. It won’t just get a bit bubbly, it will literally double in size! Once your starter reliably doubles in size for several days, you can break out the cigars because you are the proud parent of glop. Some people suggest you keep feeding it on the counter like this for up to a month to really get the sour taste. Those people must not have a life. Because just feeding this starter twice a day for two weeks is enough to make a person crazy. Trust me. By the end of two weeks you’ll be as sick of feeding this starter as you are of feeding your family every night. Once you have a successful starter you can stick it in the refrigerator until the day before you’re going to make bread. The day before you make bread the starter should be removed from the refrigerator and brought up to room temperature. Once it’s warm, add 1/4 cup of bottled water and a 1/4 cup of flour. This will help activate the starter and get it bubbly again. 8-12 hours later, do it again. Your starter should now be ready to use. b) Put the starter in a warmer part of the room, or warmer room in general. Too much work for a grilled cheese sandwich? Of course it is. You can buy sourdough bread pretty much anywhere now you know. But if you’re the curious type or LOVE baking bread you have to do this at least once in your life. If you decide it’s too much upkeep … well that’s when you start unloading it on other people by starting yourself a good old fashioned glop sharing chain letter. Just make sure to cover your mouth when you sneeze around it. DEALING WITH THE F WORD. FOOD IN YOUR CRISPER FREEZING? Can you keep some of it to start the next time? How much do you use for the bread? and your favourite Sour Dough Bread Recipe? You use whatever your sourdough bread recipe calls for Paula. 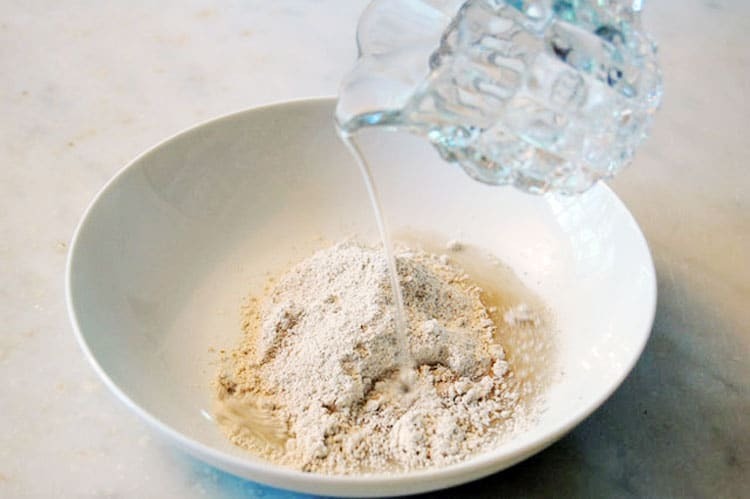 You use a bit of it ( a tablespoon or so usually) to make a batch of sourdough guck the night before you bake bread by adding flour and water to the tablespoon of active starter. Yes you always save some and then add to it to keep it going. ~ karen! Incentive to get back to bread bakind–thanks, Karen! For the love of Pete…..this seems like a LOT of work. Enough to make me (more) mental. I have to admit, I was pretty excited to read that you were going to help me make a starter for sourdough bread. I recently skulked around the bakery at my local grocery store, hoping to ask if I could buy some starter. Never did get the nerve to do it though. I have made a lovely, crusty French-style bread, but it pales in comparison to the mighty sourdough. I will give it a go but it may have to wait. My house is for sale and I have a feeling that wild yeast stinking on the counter will drive away potential buyers. I speak flavor, flavor, flavor. I said it before, and I’ll say it again. ” This is the first starter recipe that doesn’t require a degree in chemistry”. So easy I love it. I knead to make more bread! BTW, I loved seeing your saddle and boots complete with trees in the photos in the NYT! Come ride with us in Oregon! Ohhhhhh I’d LOVE to! ~ karen! I used to bake bread daily, when I lived in the same town as my brothers. I love to bake and it was nice to have people to give it to. Now I’m in the same town as my son and his family. I can bake once a week. Fortunately they LOVE sourdough. One thing I haven’t tried, they like a nice, strong sourdough for French toast! That seems weird but I suppose sweet and sour is a good combo. Maybe I’ll try it! So, where’s the recipe? I used to have some authentic Alaskan sour dough starter, but years ago when I actually lived in Alaska. I might have to go up there just to trap some of their yeasts as it was delicious. But this inspired me to try again. Thanks. I live close the the San Francisco Bay Area. Do you think I can get some of that famous flavor by keeping my windows open? You are such a fount of wisdom and often useful knowledge. Again, thank you. Genuine San Francisco wild yeast! You’re way ahead of the game. 🙂 ~ karen! and you’re supposed to name your starter … I read that in a food mag … the bakery the interviewer was writing about named theirs Murray. I was going to make some and call mine ‘Murray, too’ or ‘Murray two’ or ‘Murray 2’ or ‘Murray to’ or ‘Murray II’ … my Dad’s name was Murray and he made bread (that’s why I remember this) … but that’s as far as I got to … just daydreaming about what I’d name mine … so, yes – thanks for the recipe for making sour dough bread and the starter (there wasn’t one in that article – we were supposed to go into bakeries and ask for some starter based on the fact they would have so much extra, based on the throwing half out each feeding). It seemed like a full-time job just keeping it alive so I also wondered why would they happily just give it to us … the more I thought about it, the more I thought they’d probably prefer we’d buy a loaf of bread … it does seem like a lot of trouble. Don’t you also have a recipe to make a loaf of bread in 5 minutes. I know. I know. The tasty part that goes well with the melted cheese – hmmm. Oh boy……?Sourdough AND KAMBUCHA…..that’s what the scabies are for. I have always wanted to do both of these…. PLEASE teach is how Karen. The KAMBUCHA. I mean…? You’re next adventure???? LOVE your posts…u to… And great article-interview!! Mine’s name is Norma. She’s a badass. That’s a great name. Mine’s going to be Murray II and he will be a NastyMan! Also have you ever tried peanut butter with lettuce? Brie, fig jam, & bacon on raisin or breakfast bread is amazing. I remember that starter – it looked like thick gloppy paper-mâché glue – and gray! I was never gifted any of said starter, as I think I was not old or wise enough to be deserving. I don’t remember anyone allowing me a taste of the bread, either! I’m also having a flashback of the Amish Friendship Bread starter…flour sugar and milk and the same 10 day preparation period. Oh, the memories. I don’t think my attention span is good enough to do this twice a day for 10 days…(I must confess – I began dipping grilled cheese into ketchup when I married into that perversion!) (My first dipping experience was Sourdough/Monterey Jack/whole Anise Seed sprinkled and grilled, then dipped into a puddle of ketchup, and it was heaven.) I need a grilled cheese sandwich! My favorite lately has been a Sourdough/Carmody/Cheddar/Manchego sandwich. So rich and buttery. I thought this was a post about grilled cheese! And yes I make my grilled cheese with sourdough, but the p art you didn’t say is that it needs to be made with extra sharp cheddar cheese with chopped red onion in it — you’re welcome. Do you use a sponge too, or just the long overnight rise of the full-on dough? I’ve been playing around with different rustic bread recipes ever since reading Shirley Corriher’s Cookwise. Yes I do a pre-ferment of some type depending on the recipe it’s often referred to as levain in sourdough, but there are different names in different methods. So day one would be building my active starter to the required amount for the levain or whatever your recipe it is naming the pre-ferment. Day two is making the dough, then it goes in the fridge for an overnight rise. Day three is bake Day. It’s one of the steps is quite quickly to go through so even though it’s three days none of this is taking a lot of your active time. Challah all the way for grilled cheese. 🙂 With aged cheddar. Though this seems like an interesting experiment! Karen I swear I am not an ungrateful sod, our postal system in South Africa is just a bit fracked up. But AS SOON AS I get the lovely book you sent me I will be baking bread until my neighbours start complaining and I can’t get my bum through my front door anymore. OMG you haven’t got the package yet???!!! ~ karen! *weeps openly in the supermarket* I know, right??! I too fell into the Amish Starter trap, er, club, years ago. There were more people to feed in this house back then. I would like to make some real sour dough bread but really do not want to be held in thrall again by Glop. Good word. Will have to think about this for awhile. Will be grocery shopping soon-going to get some sour dough bread and sharp cheddar! “Held in thrall” … a perfect description of my Amish friendship bread experience. I want the sourdough starter, but I’m not sure that I have the commitment and fortitude necessary! I have a question: someone sent me a starter a couple of years ago. It’s been at the back of the fridge and I don’t think I’ve fed it in a few months. Is it still alive? Should I just set it out to warm up, feed it and see if it doubles? Can it go bad? Is it safe (ugh I hate asking that)? Thanks! Hey Ella. Just pour of top alcohol if there is any, stir it then take out 1/4 cup or so and feed it with 1/4 cup flour and 1/4 cup water and leave it on the counter. It won’t be bad but might not be active anymore. Although I’m guessing it will be. ~ karen! Ok, I will pour off he liquid and try it, thanks so much! I will let you know!! Then it turns out the jar is filled with gray glop with even grayer liquid on top. LOL. I like a person who is always ready for a local sourdough shortage. ~ karen! Red onions, bacon, and a really sharp cheddar. Ketchup on grilled cheese, yuck. But Smoked Tomato Jam on grilled cheese is to die for. I buy it in a small shop in Merrickville, ON…. but I’ m sure it could be found elsewhere. Thank you for the ketchup affirmation. I live with two otherwise lovely people who must put ketchup on their grilled cheese AND (gasp) scrambled eggs. It is so wrong. Pod people. Not a fan of sourdough, and I like my grilled cheese with pickles inside and then dipped into ketchup. I do have a question about step #3-get rid of half and throw it down the drain? Aren’t you afraid of creating a swamp monster in your plumbing? Wouldn’t want to see that coming up the toilet! OMG just squealed out loud in a coffee shop…… Thanks for that. I was recently on a quest to understand wild yeast. Now I see why the Israeli “swept” clean their homes before Passover. Yeast is what they were getting rid of so it makes since now (finally) to understand why they clean so thoroughly and were instructed to “sweep” out their homes. You have enlightened me and I’m grateful. Never knew you were passing along little gems of Biblical knowledge, did you? Anyway, my favorite food in the world is bread. BUT, I can’t eat sourdough bread and I can’t eat cilantro. Apparently I’m missing some enzyme and they taste like dish soap to me. But I know there must be a way to make your own starter without being sourdough – I think they used to use beer yeast. Any way you may tackle this idea? I would certainly babysit the product just to get my first taste of wild yeast bread sans the sour part. Notice how we always ask for more and are not satisfied with all the hard work you just put in to make a great post? We are a bunch of seagulls fighting for the bit of a new idea you spark. I LOVE your posts, sparky, just like I love Christmas Vacation. I have noticed that actually, lol. That’s O.K. 🙂 Mazel Tov. ~ karen! darn…wish this had come up during the time of year when it seems reasonable to turn on an oven in the house…as opposed to the 90 and humid time of year (which used to happen in summer, not spring). Karen, will you remind us about this in the fall? Thanks–I think. I’m going to have to check the calendar to make sure it is wide open for 2+ weeks. Why do you have to throw half of it away? I don’t understand that part. I took a bread making class through our city Adult Education. The teacher said to never put yeast down the drain–you should make sure that goes in the trash. Even after kneading–rub all of those crumblies into the trash! The thought is your drain can be a nice warm moist place with lots of food bits–you don’t want to have anything growing in there causing a blockage. I’m not sure if it’s the truth, but not willing to test it out. Always made sense to me! I remember being given a gray, unappetizing blob of starter back in the late 60’s or early 70’s. At that time, in my neighborhood in southern Ontario, it was called “Herman”. I recall it had to be kept on top of the fridge and fed a certain amount of sugar (I think!) every x number of days. So you can’t do this in that pot thingy you were typing about last week? Ummm, it sounds wonderful. I have had several unsuccessful attempts at bread baking in general and that’s it for me. But, I do make a great grilled cheese-on rye with 1 slice of cheddar, 1 slice of swiss, and one slice of muenster. we have a wonderful bakery in town that makes wonderful crusty rye with that same sour taste that’s in sourdough. I would never turn down a grilled cheese made with sourdough though. many MANY years ago (like, maybe 50 odd? ), my dad brought some sourdough bread AND some starter back from San Francisco. But my mum was not a breadmaker in any way, shape or form. While baking bread IS on my radar, making sourdough may not be. I forget to take my vitamin pill half the time lol! I live in California and sourdough is everywhere but I miss pumpernickel grilled cheese sandwiches. Absolutely luv sourdough bread and would luv to try this. One question tho- not sure about when I should transfer the starter from the cloth covered bowl to the jar? Do i put a lid on the jar or leave it open/covered with a cloth. Help ! I have another tip for grilled cheese–use ghee in place of buttering the outside. IF you keep it in the cabinet (as opposed to the fridge), it’s always soft and ready to spread. PLUS higher smoke point means it can be on the heat longer before burning, so the cheese is guaranteed to get ultra melty. 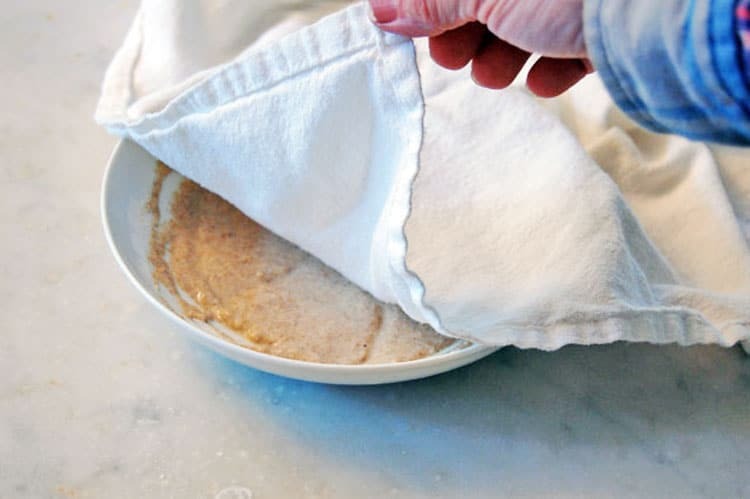 I read somewhere that flour makes a huge difference in making/baking bread….but I find that my grocery store doesn’t sell anything other the regular stuff….what are your thoughts on flour and what do you use? Hi Pauline! Flour does make a huge difference in terms of taste and texture, but I’ll tell you, I use regular white flour for making bread and it’s always good. I add some interesting flours to it like Red Fife or Rye (1/4-1/2 cup) and just that little bit completely change the structure of the bread. What I’m saying is if all you can get is regular white flour, it’s fine to use. Although I seem to have read somewhere that Canadian regular flour is different (finer ground) than American regular flour. ~ karen! I have never baked bread but makes me want to try. Sourdough bread is the only real bread. 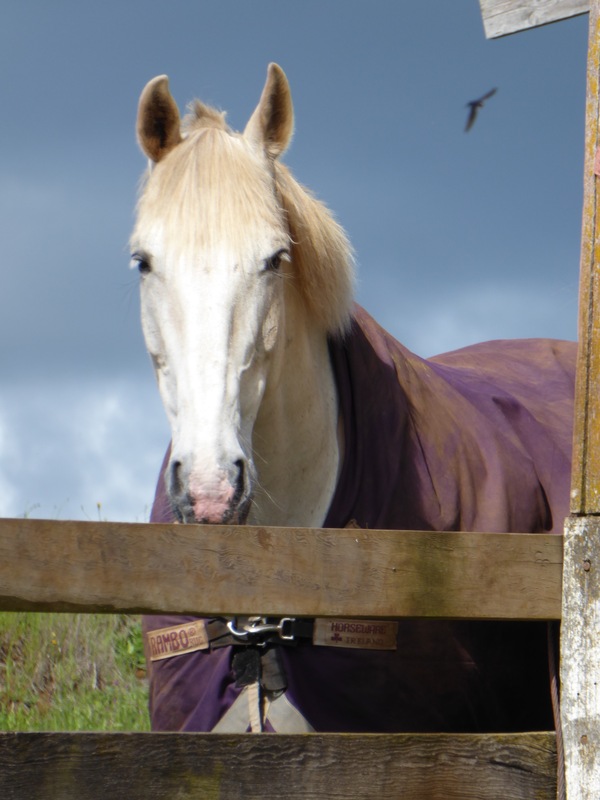 All the other stuff that tastes like sawdust …. I don’t even understand why it’s in the grocery stores. All my life, my mantra has been “If it’s not sourdough it’s not bread!”. Of course I don’t have a bread maker but people used to make bread by hand for centuries. And if I miss it up – my dog loves pizza crust so I am pretty sure she would take of whatever comes of out of my attempt. It’s pretty hard to make bread so poorly that it’s inedible. I mean … it’s bread. 😉 ~ karen! Is there a way to do this whole grain? I can’t eat white bread anymore :(… I also remember my aunt doing this and calling it Herman back in the day. I got caught in that friendship bread cult when my kids were young. Got to a point if you started to ask anyone “Hey would you like some…” everyone would say “NO friendship starter NO!” My biggest problem is I hate throwing food away, so I would end up with ALOT of starter. Hubby uses mayo instead of butter on the outside of his bread. Browns nicely, but I want that butter taste! I use a nice soft 100% whole wheat & cheddar. A bit of apple butter on the inside is tasty too! Hi Karen , HELP ! thought i would try you one more time with this question: I’ve made the SD starter-it’s day 5 now . When should it get transferred to a jar and how do i cover it at that point ? Do i put a secure/ tight lid on it (the metal one that comes with the jar) or just cover with a cloth again? thx. PS: it’s looking and smelling good and sour already. Hi Connie. Have you continued to feed it by adding flour and water to it every day? ~ karen! up- i ‘ve been feeding it daily. Thx Karen for that info. It’s in a jar now with a linen napkin on it ….. it’s bubbly and sour-ish…So far so good 🙂 Can’t wait to bake it. I find sourdough though has a certain flavour to it. Thin, dense rye bread on the other hand isn’t very flavourful and is thin, yet dense enough that it lets more of the cheese flavour to come through.